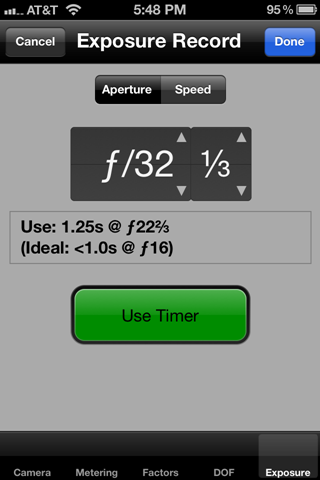 ExpoDev is unique among analog exposure calculators in that it uses actual personal film test data to drive the exposure calculation process. 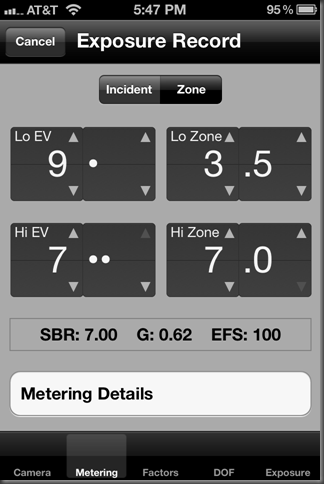 This probably makes ExpoDev the most accurate B&W exposure calculator in existence as it uses your personal data that is derived from your equipment and your working processes. Here are some details on what that means exactly and how it works. With previous versions of ExpoDev (for Palm and PocketPC devices), getting data onto a device was cumbersome at best. ExpoDev had to rely on the software tools supplied with each of these devices to sync the data. For Palm devices, that software won’t even run on modern operating systems like Windows 7 or OS X.
I’m happy to say that those issues are a thing of the past now. 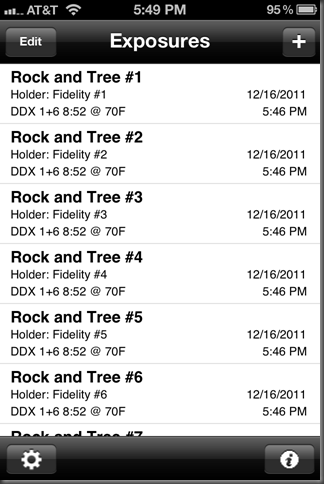 ExpoDev for iOS can open film test data files directly with no computer intervention. That makes this new version of ExpoDev truly platform independent. Since all Apple iOS devices have both Internet and email connectivity, you can simply email the film export files as attachments and open them directly on any iOS device. ExpoDev would then import them directly into your library of films. That’s not the only way though. If you already sync your iOS device with Apple’s iTunes (available for both PCs and Macs), you can also import and export data files for ExpoDev directly using iTunes. Down the road, there will be other options like an online film test database to allow you to retrieve your stored film tests. This last option will be especially useful to people who have used the View Camera Store’s film testing service in the past as it will allow them to retrieve their test results at any time. How do you get personalized film test data? By using the film testing service from ViewCameraStore.com, who will help you by sending you pre-exposed test film to develop that you then send back for analysis. In return, they send you your personalized film test files. Either method is effective, it just depends on how much you want to personally do. If you’re serious about testing materials, shoot lots of different film/developer combinations or perhaps want to target several different printing processes, you might think about owning and using Plotter yourself (available through ViewCameraStore.com). However if you just want to get better negatives than you do now, you might consider using the View Camera Store’s film testing service to quickly get up and running. What does an Export Film data file contain and how is it used? Film analysis produces two main charts that are used by ExpoDev when calculating exposures, the Average G (Average Gradient) to EFS (Effective Film Speed) lookup chart and the Average G to Development Time lookup chart. 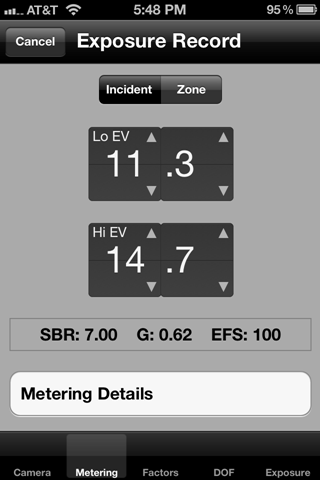 For each scene that you meter, ExpoDev will calculate the SBR of the scene (Subject Brightness Range) and the corresponding Average G. It then uses the film test charts for your selected film and developer combination to lookup the EFS and the Development Time to use when calculating the exposure. This process directly ties the film test, your equipment, the scene, and the resulting exposure together in a closed-loop which makes for very accurate exposure calculations. In actuality, there are many other things that are also taken into account such as the Paper ES (that printing paper’s Exposure Scale, which controls the target density of your negatives), Lens Flare, Filter Factors, and film test reciprocity data (which will be covered in another article as it is its own topic). If this is the first article on ExpoDev you’ve seen, be sure to check out the others on this site (and check back again for future articles). Next time I’ll cover how ExpoDev uses the reciprocity test data as produced by Phil Davis to adjust both exposure and film development for over 90 different film and developer combinations. Today I’m going to start a series of short articles on ExpoDev for iOS. My goal is to talk about some of the unique features that set ExpoDev apart for other analog photography apps on the market. I’ll try to get something new out each week. 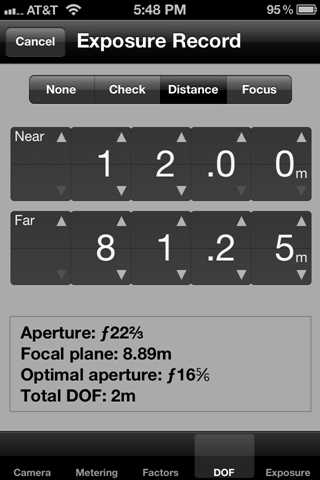 ExpoDev has many unique features that you won’t find anywhere else, such as calculating exposures based on personal film test data, the only exposure calculator which applies reciprocity adjustments that are based on actual lab-produced film tests for a multitude of film and developer combinations, the ability to calculate exposure and development to produce negatives which will closely mesh with different printing processes whether that be silver, platinum, digital hybrid/scanning, or any other alternative process. This is just the tip of the iceberg and I hope to talk about them all in upcoming articles. But first an update: Beta 2 of ExpoDev for iOS is nearing release in the next few days. This release is about 95% functionally complete with the only thing left to complete being ExpoDev’s Depth of Field calculator. At it stands now, it is completely usable in the real-world to calculate and catalog your film exposures and development information. The exposure calculation system within ExpoDev have been extensively field test on other platforms for almost 10 years now (I’m referring to ExpoDev for PocketPC which has a smaller, private release). 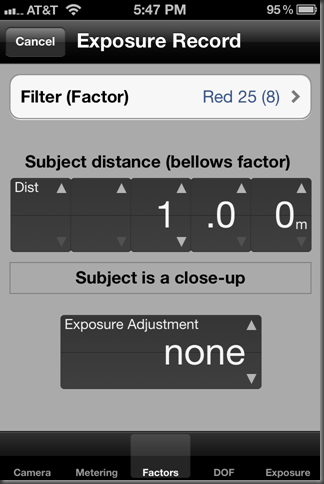 It is also a significant upgrade to the exposure calculation system used in ExpoDev for Palm, used by many of photographers today. 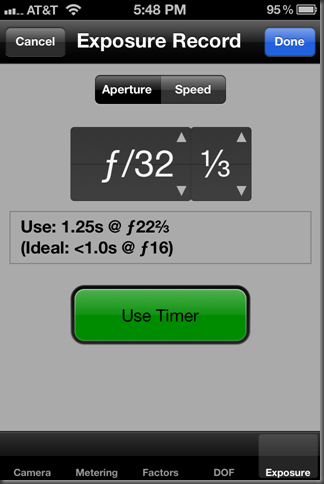 I’ve personally produced hundreds of 4x5 B&W negatives using ExpoDev’s exposure calculator and I have never had a bad exposure (at least not due to ExpoDev – photographer error is another story). After I get Beta 2 out the door I will write a few articles on ExpoDev’s unique system of exposure calculations and reciprocity adjustments, which is probably the most accurate reciprocity adjustment calculator in existence. Until then, here are some previous articles to catch up on things. ExpoDev for iOS now in Beta testing! 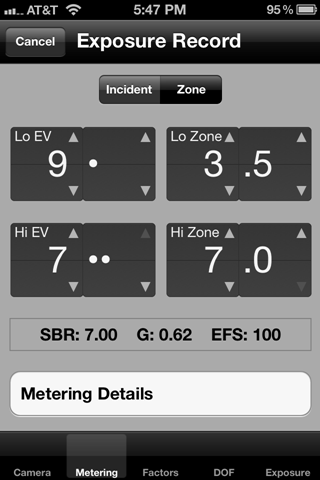 I’m happy to announce that ExpoDev for iOS (for the iPhone and iPod Touch devices) was recently released into Beta testing. Things have really progressed since the initial previews were posted here. ExpoDev is now functional enough to use in fields tests with everything working with the exception the Depth of Field calculations (which will be working by the next Beta version). 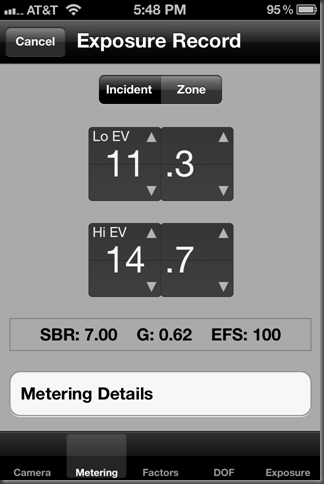 What makes ExpoDev so special (and different) from other exposure calculators is that ExpoDev uses your personal film testing data to determine the proper exposure and development time for each and every scene, matching the scene contrast to a target film contrast. Since this personal film test data is keyed to your personal working methods, material, and processes, what this means in a practically sense is that B&W negatives produced using ExpoDev will be far more consistent and far easier to print (or digitally scan). 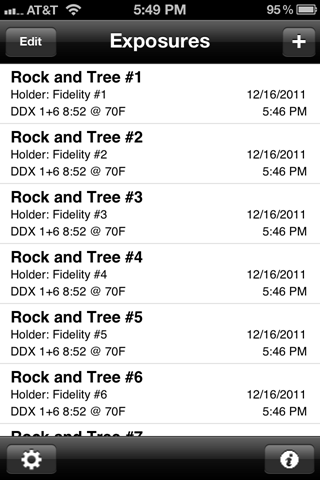 ExpoDev for iOS also makes it even easier to get your personal film test data imported than previous versions. There are two ways to import film test data into ExpoDev, via email or via iTunes. For those of you that use the View Camera Store’s BTZS film testing service this is as simple as receiving the email with your test results and then opening the film test files on an iPhone or iPod Touch that has ExpoDev installed. ExpoDev will then offer to import the film test data into your library of films to use. 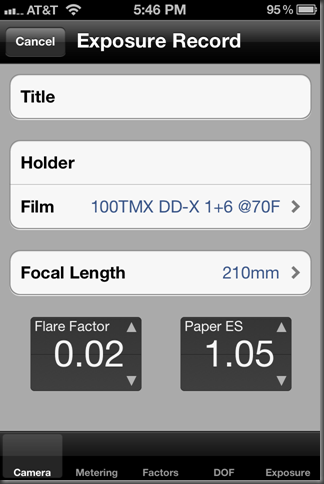 For those of you that produce your own film tests using Plotter, you can connect you iPhone or iPod to iTunes and simply drag over the exported film test files to import them directly into ExpoDev. Details on that process are here on Apple’s website. 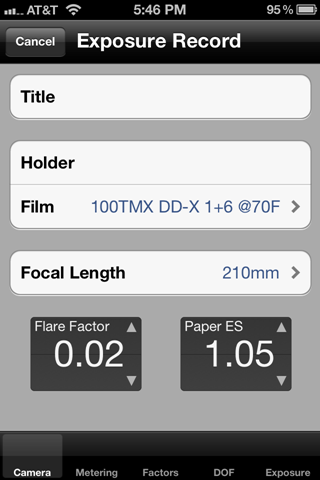 In addition to making it even easier to manage your film library, ExpoDev for iOS also manages your list of lenses and filters (along with their factors) for easy selection in the field. 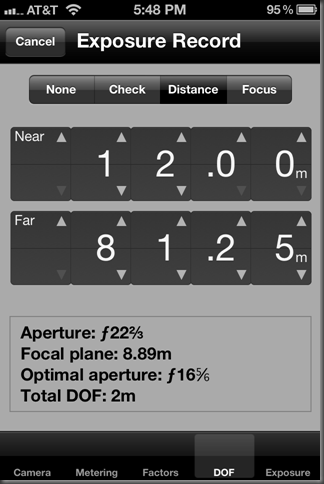 It’s new Depth of Field calculator offers several different methods of working and gives you complete control over image sharpness by letting you choose the Circle of Confusion size for your film format and printing preferences. I’ll cover all of this and more in future blog posts. In the meantime keep checking back here often as well as over at the new ExpoDev for iOS forum to join in the discussion.